So I was planning on doing outfit pictures yesterday wearing my new pink coat. But the weather did not allow that. It was rainy and gloomy all day yesterday. So instead I decided to share all of the details from my most recent Instagram pictures. The last outfit is one of my all time favorites! The grey sweater and the Pink coat were both part of the big order that I recently placed from Sheinside. I really have been looking for a pink coat for a while. Sheinside had a few to choose from and sometimes it is hard to tell what they are going to look like in person. But I got so lucky with this one. It does look a little different online then in person. But is is cuter in person. It was exactly what I was looking for and the best part is how inexpensive it is. I really really love it and highly recommend it. Sheinside also has some really great chunky cable knit sweaters. I love the one I am wearing because it can actually be worn off the shoulders. Which is different than any other sweater that I have. I linked a few others that I love above and below! So I was aslo planning on posting our maternity pictures earlier this week. But things have been so hectic. I am 100% posting them on Tuesday next week. I am so happy with the way that they came out and I am so happy that we have them to remember this special time forever. I can't wait to share. Love these photos! You have amazing style! that pink coat really is super cute! as are all of the outfits shared in this post. I really love all the plaid! Love all these looks, especially that pink coat! 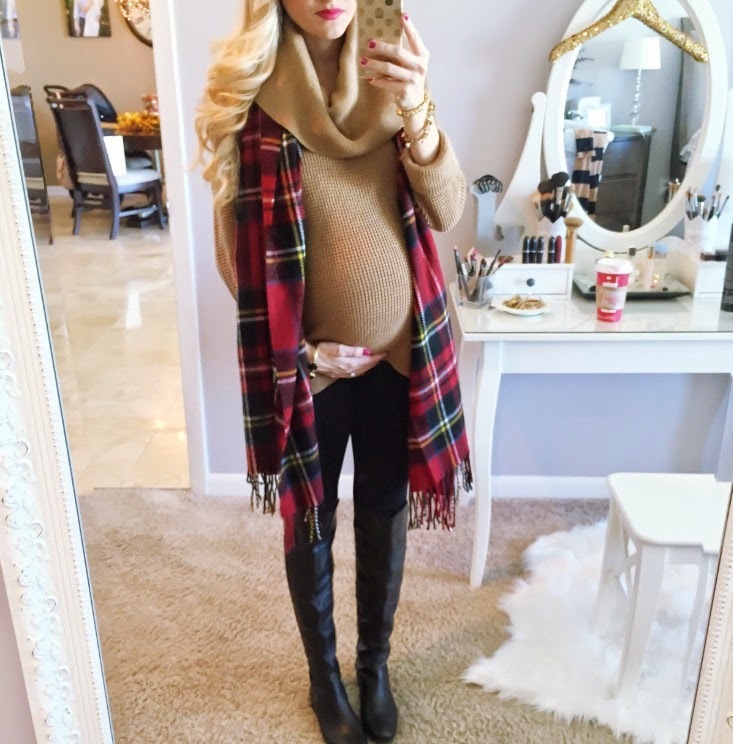 Have you found it hard to wear heels while pregnant? I hope to still be able to wear them when I'm pregnant someday but am nervous! You are so fab! I love all of the scarves! These outfits are so seasonally festive I'm so obsessed! So adorable! My baby bump was so low that none of my regular shirts fit. I was in ALL maternity really early on! You have such amazing style! Will definitely be checking out SheInside! I follow you in IG and I love it! all beautiful outfits. I wish I looked that great every day! OMG that coat from SheInside! I'm obsessed. I just looked at them on their site and I want one in EVERY color!! Omg, you are TOO cute! & that's a great deal you found on that scarf at SheInside! Super cute outfit ! Can I ask you, how do you find sizing from She Inside? Does it run fairly small, or is it "normal"? Thx!